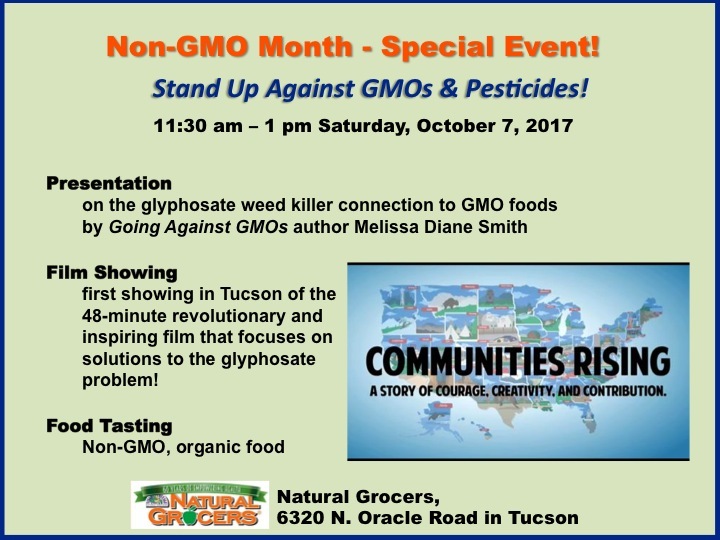 ‘Stand Up Against GMOs & Pesticides’ Presentation, Film Showing and Food Tasting on October 7 in Tucson! October is “Non-GMO Month,” dubbed that term in 2010 by the Non-GMO Project to increase awareness of genetically modified organisms (GMOs) in our food and of how to shop non-GMO. And, boy, has awareness increased since that time! Today it’s common to turn on mainstream television and see ads by mainstream companies proudly announcing that their products – from Triscuits to Cheerios – are non-GMO. We are well into the tipping point of consumer rejection against GMOs in the United States! Yet, while awareness about GM foods has dramatically increased, understanding of the widespread use of herbicides, particularly the use of glyphosate, found in Roundup weed killer, which goes hand in hand with GMOs isn’t nearly as far along. To kick off Non-GMO Month, Natural Grocers and Going Against GMOs author Melissa Diane Smith are teaming up to hold a special event about the hot-button issue of GMOs and pesticides from 11:30 am to 1 pm on Saturday, October 7, at Natural Grocers, 6320 N. Oracle Road. The event will feature an informative presentation by Smith followed by the first showing in Tucson of “Communities Rising,” a 48-minute film that focuses on the glyphosate problem and solutions to the problem that are taking place across the country. View a trailer for “Communities Rising” here.